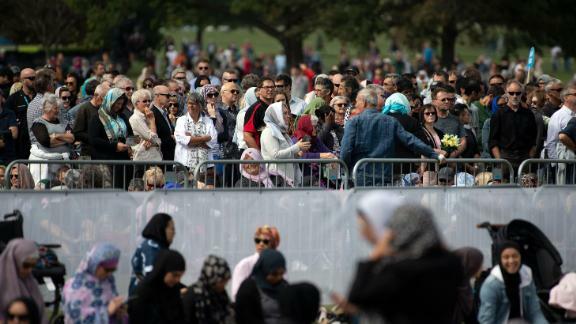 New Zealand residents came together in Christchurch to remember and honor the victims of the mosque terror attacks. President Trump shook up longstanding US policy regarding the Golan Heights, a highly contested and strategic region claimed by both Israel and Syria. In a tweet, Trump said "it is time" for the US to "fully recognize Israel's Sovereignty" over the region. This is a huge foreign policy win for Israeli Prime Minister Benjamin Netanyahu, and it couldn't have come at a more critical time. In less than three weeks, Israelis head to the polls to decide whether the embattled Netanyahu should remain in power. And, it's no secret that the Israeli leader is close with Trump. In fact, the President will host Netanyahu next week for dinner and talks at the White House. Since Trump is well-liked in Israel, his bond with the Prime Minister could hold some serious election sway. Facebook is facing yet another privacy flap. The company announced it mishandled sensitive passwords for hundreds of millions of its users and stored them in plain text (meaning: easily readable) format in a database that could be accessed by employees. Most of the affected passwords belong to people using the platform's Facebook Lite version. A Facebook executive said the company usually masks people's passwords, so no one working at Facebook can see them. Oh, and don't forget, Facebook may soon face a massive FTC fine because of issues with its data privacy practices. Phew. The latest Brexit crisis is finally solved -- kind of. UK Prime Minister Theresa May got her requested Brexit delay, but the deal isn't without its stipulations The EU actually rejected May's proposal and instead imposed its own timetable: If the UK can pass a withdrawal deal, it will leave the EU on May 22; but if it can't -- which is totally possible -- it'll get an unconditional delay until April 12 to offer new proposals for a way out. Meanwhile, communications between British leaders reveal security officials have advised British members of Parliament to take taxis home over fears that they could be attacked by members of the public over the handling of Brexit. A new study reveals deaths from the synthetic opioid fentanyl skyrocketed more than 1,000% from 2011 to 2016, with deaths practically doubling every year starting in 2014. The study also found that by 2016, men were more than three times more likely to die of fentanyl use than women. And while deaths rose in every age group, the largest increase in death rates was among younger people, between ages 15 and 34. These staggering numbers are just another piece of the deadly puzzle of opioid abuse that lawmakers and medical professionals are scrambling to solve. The CDC confirmed last year that fentanyl is now the deadliest drug in America. Recent historic flooding in the Midwest has devastated local farm businesses. Untold livestock have died as a result of rain and rapidly rising rivers. Entire harvests have been submerged, unsold grain has been ruined by moisture and some fields are so sodden, they may not be usable for awhile. Nebraska Gov. Pete Ricketts called the heavy rain and snow that's led to the record-breaking flooding the "most widespread disaster we have had in our state's history." Unfortunately, the risk for severe flooding in the region and beyond may continue through May, the US National Oceanic and Atmospheric Administration says. NOAA predicts 200 million people, many in the Midwest, Great Plains and Mississippi River valley, are at risk this spring for flooding. North Korea has withdrawn from a joint liaison office near the demilitarized zone that was opened amid warming relations between the two Koreas. The move comes after the US slapped two Chinese firms with sanctions for doing business with Pyongyang. Healing thoughts and bended knees for our queen. The first Harry Potter book came out in 1997. Girl, you've had time. Levi's CEO: Don't put jeans in the freezer. Or the washing machine. So ... what are we supposed to do, boil them? A Chinese buyer bid more than $1.4 million this week for what species of racing animal? Play "Total Recall," CNN's weekly news quiz, to see if your answer is right. That's how old Jimmy Carter is today, making him the oldest living former American president in history. "New Zealand mourns with you; we are one." New Zealand Prime Minister Jacinda Ardern, addressing the Muslim community Friday during a national day of reflection. The Muslim Call to Prayer was broadcast on national television at 1:30 p.m. local time, followed by two minutes of silence to remember those who lost their lives in the terrorist attack one week ago.